Interested in adopting a pet? 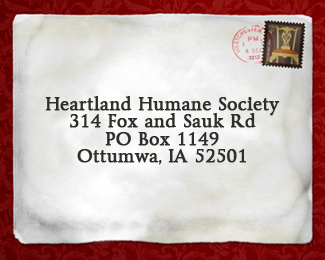 Take to Heartland Humane Society during operating hours and complete the adoption process. Congratulations on adopting a pet from Heartland Humane Society. Thank you. Heartland Humane Society is a no-kill shelter for dogs and cats. The mission of Heartland Humane Society is to provide temporary shelter and care to homeless/lost animals, to educate the public on proper care of animals, and to promote neuter and spay programs. You must use our PO Box for correspondence by mail.